Last Friday hundreds of students flooded the auxiliary gym to sign up for the countless clubs offered this year. With well over 30 clubs available to students this year choices were not exactly lacking. 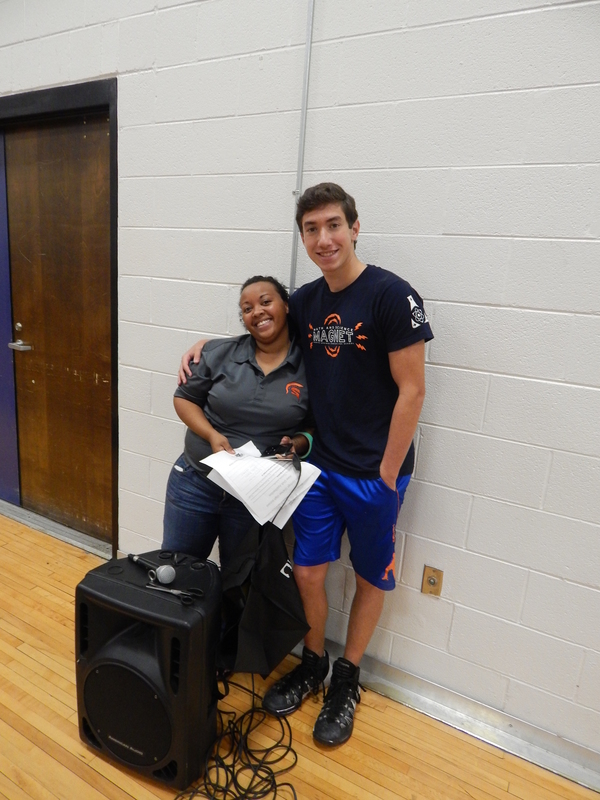 The event was run by Ms. Jenkins and Justin Cohen who kept things running smoothly amidst the chaos of excited students and anxious club founders. Said founders, presidents and representatives arrived at school Friday at 7:30 to begin setting up their displays. With electricity hookups, large banners and even hundreds of small plastic soldiers to be set up by the various clubs this early meeting was certainly appreciated. The Computer Science Club even had an online form available to remotely sign up for clubs. The logistics of the whole event were unsurprisingly impressive. The Australian Football Club for instance attracted over a hundred prospective members and locked down the corridor’s airwaves and airspace with zealous chants and demonstrations of the game. This over the top advertisement didn’t stop there, the Parkour Club’s president Ryan Walden could be seen vaulting over tables and back flipping, par the course. The Anime Club’s members dressed up in showy costumes and proper cosplay and danced about waving examples of anime artwork to draw in members. The advertisement methods all varied widely and made for an interesting, if sometimes hazardous walk around the tables, especially with Mr. Cohen on the microphone. All this contributed to a pleased audience, with excited students travelling from table to table signing up for more clubs than they could keep track of. One Emma Spiegel had this to say, “It was a great way for me to see all the club opportunities that North Springs has to offer.” Clearly pleased with how the event panned out. Lollipop wrappers and fake mustaches lined the floor, discarded from the prizes won at the various clubs’ events at the Club Rush and satisfaction seemed markedly high. For the folks running the clubs though he whole event wasn’t necessarily sunshine and rainbows. The event took place the entire school day, approximately seven hours, during which the club contacts not only stood up but were running about taking care of things as well as enthusiastically presenting their club. It was clearly a taxing day for those involved in making it happen. On a negative note as well, some felt disillusioned due to the multiple challenges facing membership, primarily the lack of ability for many students to participate after school. Max Thornton expressed his approval, checked with a realistic disappointment in the nature of club membership, “I feel like it did the best it could with the resources it had, but some kids just don’t want or can’t join a club. It did very well at getting people who wanted to join a club in a club though.” Despite these challenges and inherent disappointments it appeared that club leaders were content with the fruits of their labors, many clubs reeling in significantly more than a hundred sign ups each. Overall this year’s Club Rush went off without any crippling hitches. Keep in mind also that, if you didn’t sign up at Club Rush it’s certainly not too late to do so. On a similar note as well some clubs did not, for a multitude of reasons, participate in Club Rush so what one saw at Club Rush was not the entire spread available for the extracurricular minded student. This was a good start for many new clubs and many older ones as well, the 2014-2015 school year should be a busy and fulfilling year for our North Springs clubs.